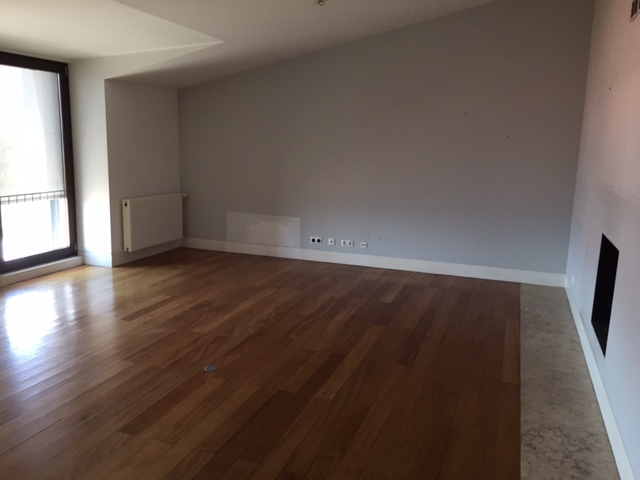 In my last post, I offered some general information about buying property in Portugal and obtaining a residency visa. Although I haven’t committed to this step, Richard and I did visit three properties — just like the people in “House Hunters International” — to get an idea of what kinds of options are available for people seeking to spend enough for the Golden Visa program but not necessarily match what Madonna is dropping for her Lisbon digs. House #1, a row house still undergoing renovation. 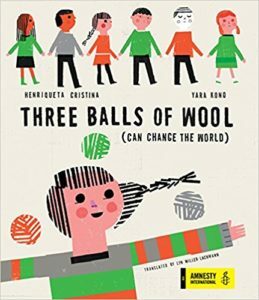 Like “HHI” clients, we put together our wish list, though we had the inevitable tradeoffs. We wanted an older building, one with charm, that had been restored with modern conveniences like 21st century plumbing. We remembered our great view from the garret we rented in 2012, but most charming old buildings are walk-ups and we’re concerned about aging in place in a walk-up building. So an elevator was on our wish list, or else a ground or first-floor apartment (in Europe, the first floor is one flight up from the ground floor). But elevators are scarce in older buildings, and low floors would preclude the view. View of the street and ever-popular 28 tram route from House #1. Wish list in hand, we took off for the apartments. 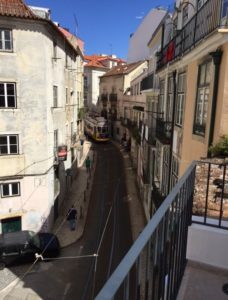 Unfortunately, our first choice, a ground floor with a garden near the charming Praça das Flores, a block from a fish market and on the same street as our favorite ice cream place, had just gone into contract. Our realtor, Filipe Froes of the ReMax Valor Group, said that good properties tend to sell very quickly, something I also noticed in my visits to open houses in New York City. Nearby, though, was a row house in the process of restoration. 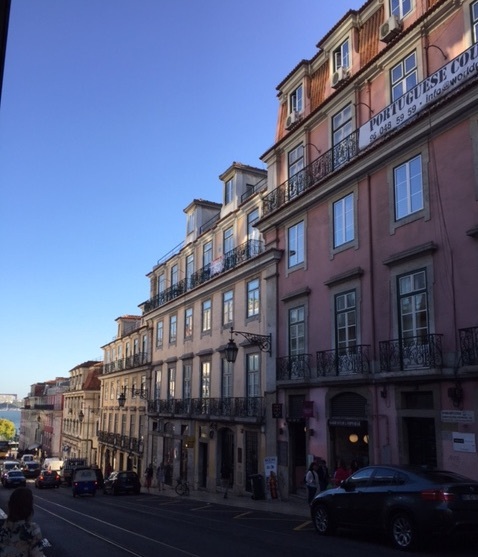 It wasn’t in the Principe Real neighborhood but a few blocks southeast of Rua de São Bento near the National Assembly building. That area is close to where we lived in 2014, and three years later stores of all kinds are beginning to open on the major streets. However, the row house is far from the Metro, and decent grocery stores and fish markets are a healthy walk. The house itself was originally designed to be a guest house; hence its six bedrooms had their own bathrooms. The inside was narrow, with a lot of stairs to climb, and although it was selling for around 600,000 euros, we felt it was too much house for us. I took pictures of the lovely urban view — including the 28 streetcar tracks — and we moved on. House #2 was built in 2005. 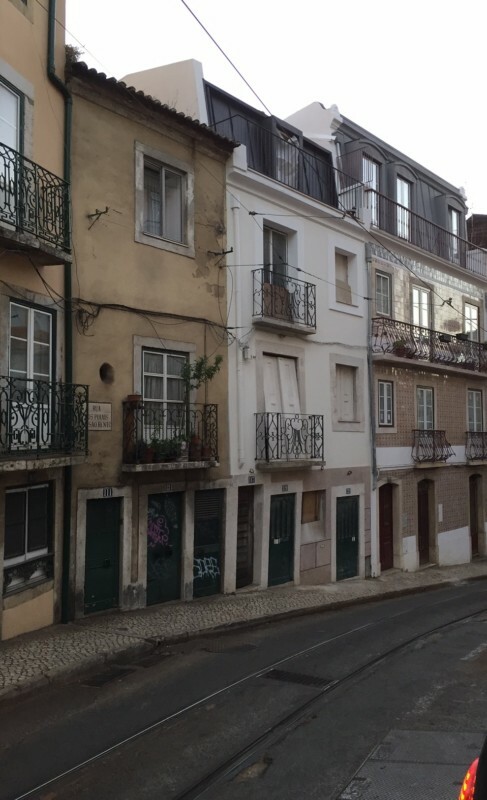 Our second house was the closest to our target neighborhood, on an uncharacteristically quiet street in the Bairro Alto, a quarter known for its bars frequented by both tourists and locals. The building dated from 2005 and thus had an elevator and all the modern conveniences. Rooms were large, and the top floor apartment had a spectacular view of the river and the 25th of April Bridge. 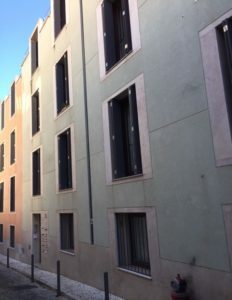 This was also the most expensive of the three apartments by far, with an asking price of 950,000 euros. While the Metro is a bit of a walk, shopping and many of our favorite restaurants are close by. For us, the apartment was the perfect size, and I took pictures of the interior rooms as my husband shook his head and said, “Our furniture will fit, but it won’t look good here.” True. From the outside, the building fit in well with its surroundings, but the interior didn’t have a lot of charm or character. So we kept looking. Living/dining room of House #2. Our house hunt took us to Chiado, the downtown neighborhood that is becoming increasingly popular among expat buyers for its closeness to night life and transportation. 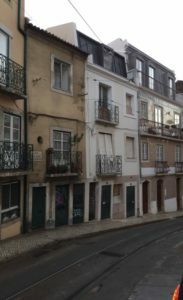 For 550,000 euros — the cheapest of the three — we could have a sprawling four-bedroom apartment on the top floor of a building dating from 1788, constructed 33 years after the devastating 1755 Lisbon earthquake, fire, and tsunami. The building, though, was a walk-up, four flights of steep stairs. And the apartment was in need of major renovation and repair, including water damage from the replacement of the building’s roof. Some of the work, such as the water damage, would be fixed before the sale, but if we wanted to restore the apartment completely to its former glory (though with modern plumbing), we’d have to pay about 60,000 euros — and supervise the work. The exterior of House #3, built in 1788 and just blocks from the river. Froes suggested another alternative that many foreign investors are now taking up — the apartment-hotel. A lot of the restoration work going on in Lisbon is being done at the behest of developers who are then selling the apartments to people who can either live in them or turn them over to the developer to rent out to travelers on a short- or longer-term basis. To attract buyers, these developers have guaranteed a 4% return for the first three years. [Updated June 6, 2017] In my initial post, I forgot to mention one thing — taxes. Buyers from the United States may be pleasantly surprised to discover that property taxes are relatively low because they only fund municipal services. Schools in Portugal are centrally funded, via the value added tax (VAT), which also serves to reduce inequities among schools and regions. A typical municipal tax burden for house #2 would be around 3,000 euros a year, and a buyer would also pay a few hundred dollars to the management company for building management and repairs. Upon closing the deal, buyers do pay 4% of the sale price to the national government as a transfer tax and 0.5% to cover registration of documents. We ended our hunt with a lot to think about, as well as the knowledge that new properties constantly come on the market. We were glad to see such a wide range of homes in terms of location, configuration, era of construction, and renovation needs. 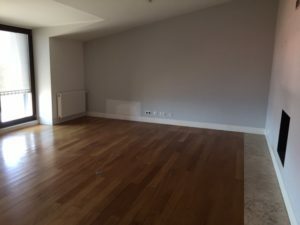 If you are considering buying a place in Lisbon, particularly one that can facilitate a residency visa, I hope our house hunting experience will help you in your quest. Thank you, Nathalie! We haven’t made a final decision, and a lot depends on where our children end up. We would miss being an ocean away!